Looking for more internships in Animation? Check out the most recent internship postings in Animation. Below you'll find all of the companies that we've covered that may offer internships in Animation. You can also look at entry level jobs in Animation. This is my favorite part of the year when it comes to One Day One Job because all of those annoying kids finally go back to school. Just kidding. I actually love late August for a completely different reason: the Inc. 5000 is released. In case you aren’t familiar with it, it’s a ranking of the 5,000 fastest growing privately held companies in the United States. The metric that they use is three-year revenue growth, and that makes the list an amazing tool for finding up and coming companies with great career opportunities. This year Fuhu came in at #1 on the list with 42,148% three-year growth to $117.9 million in revenue. The El Segundo, CA based company that aims to be “the leading designer, seller and innovator of ‘thoughtful’ consumer products and services for children.” When you make stuff that kids like, parents empty their pockets. I sometimes get embarrassed by how many screens I use at once. I have legitimately browsed Facebook on my phone while I was sitting on the couch watching tv with my laptop on my lap and my iPad tuned into MLB.tv. Just typing that kind of makes me feel like an idiot, but that’s the way it is now. This provides an interesting dilemma for advertisers. When we only had one screen in the house (the tv), they didn’t get 100% of our attention. Now there’s a good chance that we won’t even notice the ad on the channel that we’re watching. Tremor Video is a New York, NY based company that is working hard to increase engagement with video advertising, and one way they’re doing it is by hitting you on every screen you own. Their mission is “to bring the certainty of science to brand marketing,” and it sounds like they’ve developed some pretty cool technology to do that. What have you done to improve your skills besides going to class? Nothing is not an acceptable answer. Self-improvement not only makes you immediately more employable, but it also signals to employers that you’re the kind of person that can grow in a company. There are plenty of ways to improve yourself as a candidate, but one of the easiest is computer training. In a short period of time you can significantly expand the number of jobs that you can apply for. TrainSignal is a Schaumburg, IL based company that offers video training for software from Microsoft, Cisco, Citrix, VMWare, CompTIA, and more. They provide both online video and physical media, and they serve both individuals and businesses of all sizes. I have to admit that I’m a little bummed that the holiday weekend is over. Since it’ll be a solid 2 months until we get another one, we’re going to have to make do with Hill Holliday. They’re a full-service advertising, marketing, and communications agency with presences in Boston, MA; New York, NY; and Greenville, SC. It all started in Boston in 1968 as Hill, Holliday, Connors, Cosmopulos, Inc., and now it’s a firm of more than 800 employees with some really big name clients including Dunkin’ Donuts, Major League Baseball, Anheuser Busch, CVS, Liberty Mutual, Bank of America, and more. Unless you are a total hermit, there’s almost no way that you wouldn’t recognize at least some of their work. A few days ago I saw a retweet from Peter Gammons’ account about some job opportunities. That seemed a bit odd to me since Peter Gammons is a baseball reporter and analyst, and the jobs didn’t seem to have anything to do with baseball. I made a note of it and went back to what I was doing. Today I went to check out 38 Studios, and I realized that Gammons was retweeting Curt Schilling, the former Phillies and Diamondbacks pitcher (he may have also played for the evil Red Sox, which is probably why Gammons, the biggest Red Sox homer ever, was retweeting him). Anyway, Curt Schilling is the founder of 38 Studios, which is “an entertainment and IP creation company in development on a broad range of products, including online and console video games, toys, novels, comics, film, TV, and other forms of digital media.” I’m not sure how I’d describe the stuff that they’re putting out, but if I had to pick one word it would be fantasy. Like I said, nothing to do with baseball. 38 Studios was previously based in Boston, MA, but they’re in the process of moving to Providence, RI, and that’s where most of their jobs are now. Last week I came across a pretty cool picture from the filming of Pirates of the Caribbean (I have no idea which of the movies). 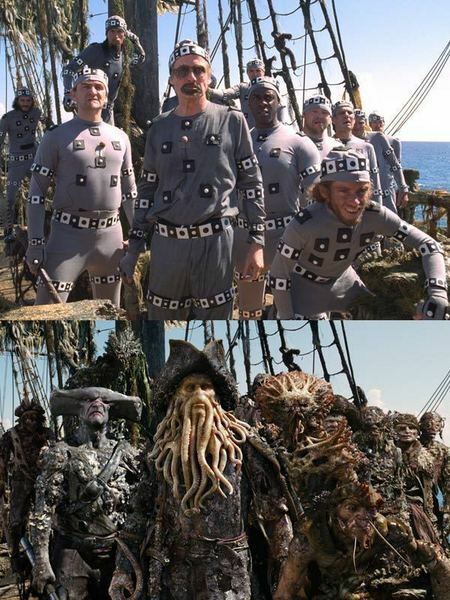 It shows what the actors looked like when the movie was being filmed, and then what they actually look like in the movie with all of the CGI and special effects. How do actors take themselves seriously with little balls stuck all over their body? Fortunately, they won’t have to much longer if Organic Motion has anything to say about it. They’re a New York, NY based company that “a leading innovator of computer vision and highly advanced motion capture systems.” They’ve developed a combined software/hardware solution that enables computers to capture the motion of humans and other organisms—no little balls necessary. It’s a huge breakthrough that can be used in all kinds of different applications. Have you told your friends about One Day, One Internship? Share us on Facebook and Like Us too (apparently Facebook has moved away from Fans and now prefers “Liking”). It’s Opening Day of the baseball season, and I’m thrilled that I’m looking at 6+ months of meaningful games for my favorite sport. Last night was disappointing in that the Yankees blew a solid lead in a sloppy game against the Red Sox, but even that can’t drown out my excitement about the hope brought by a new season. Along with a new season comes new technology. Television and online broadcasts are constantly getting better, and not just in quality. There are all kinds of new technological innovations that are making sports more fun to watch, and a lot of them are coming from Chicago based Sportvision. It all started with the FoxTrax “glowing” hockey puck (which was pretty much a miserable failure), but now we have things like the “virtual yellow 1st and Ten line™, KZone™ virtual strike zone, and the RACEf/x system on NASCAR broadcasts.” Each of these was created by Sportvision.